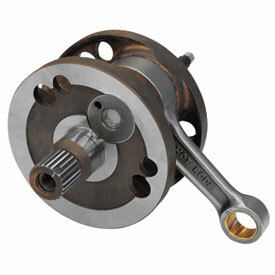 Keep your rebuilds short and sweet by using quality components like the Hot Rods Complete Crankshaft Assembly. Hot Rods crankshafts are made from some of the highest quality forgings available, and thanks to an entire system of quality control checks and rechecks, these cranks meet or exceed OEM parameters. And Hot Rods tunes and trues their components to OEM specification for your bike, ATV, or UTV so you won’t have to do any guess work or tuning of your own. Each component is copper plated, case hardened, heat treated, CNC machined, and held to a tolerance measured in microns for the best fitment and friction reduction possible in a crankshaft. This package comes pre-assembled with connecting rod(s), top-end bearings, and crankshaft webs so you’ll be able to simply drop it in and keep moving on with your build. I now have 110 hours on this crank in a crf450. Has performed perfectly. Just put a 3rd piston in & still no play in the lower end. Its as tight as it was when installed. No reason to think it wont go another 100 hrs. Im sure it will. I do change my oil about every 8-10 hours of run time & use motul 300v oil. Very happy with this part. Ive purchased one for my ktm 300. Also used hot rods bearings & seal with the crank. After a bolt in the bottom end worked it's way loose and destroyed my crankshaft it was time for a total engine rebuild. Bought this crank shaft with the hopes that the lower price didn't mean lower quality. The crank came in spec per the Yamaha manual and fit without problems. The construction and materials used seem to be solid and so far have no issues on about 20 hours of run time. Time will tell if it holds up, so far it's been a great buy. Great crank, it was easy to install andfit perfect. I can't wait to see how this crank will do inside my 1992 KX250. Happy to see that they had it for my old restoration project. Installed a Hot Rods Crank 100+ hours ago on my KTM 200 Race bike. If yours didn’t last it’s a lubrication or installation issue. Thanks Hot Rods for a great Ready to install crank and Rod Combo. Anything dirt bike or atv i rebuild it always gets a hot rod crank. You cant beat the quality!! This crank seems to be built very well. I just installed it, so we will see how it holds up. I haven't installed this yet but it came 4 days before scheduled. Very fast shipping. Waiting on a tool I ordered to split the casing. Will update later when installed. Perfect crank assembly and has held up to the test of time and abuse. what a great deal. so much less then oem and even hot rods web site. rm hooked me up! Great crankshaft assembly easy to install and much better design than stock with copper bushing where the wrist pin goes. I've used hot rod cranks for years and never had any issues. Along with a Wiseco piston, it made my YZ250F unkillable! It's been running more than 50 hours on a track without losing any of its pep! I'm afraid everything else will break begotten that combo. Money is better spent on an oem crank. The hot rod cranks aren't balanced as well as oem and don't last as long. Very happy with this product. I have a hopped up CR500 that makes about 65HP and this is part of it. Race it up Sand Mountain in 4th Gear Full Throttle. Easy to install everything set right. Use hot rods in all my rebuilds. If you remember the good old daysof pressing in the wrist pin you'll love this product. I have used Hot Rods cranks in both my 2 and 4-strokes and have never had a problem, I have had the one in my CR250 for 100 Hours now and still going strong! Great quality, great longevity and although a bit spendy it's far less than a stock crank and just as reliable. This is a much higher quality unit than the Wiseco it replaced, which had a meltdown shortly (about 15 min.) after a complete and thorough break in. The Wiseco was purchased from another company, that apparently doesn't back there products.and I no longer use them as they failed to remedy this problem. I love the fact that it drops in. Direct replacement for OEM. I've installed several and have had only one come apart and I'm sure that was operator error. I use this kit every chance I get! Not a very good experience, crank locked up after 3 hours of use. Everything was new from top end to bottom end at time of installation. I installed this crank when doing a bottom end rebuild on my 2004 YZ250. There were no issues with the installation, and I have put 40-50 hours on it so far with no problems. Feels much better to have the bottom end rebuilt and this crank really did the trick. When you think of a crankshaft the first name that comes to mind is probably Hot Rods, and for good reason. Hot Rods products have set the bar exceptionally high and are hard to beat. If you love your ride as much as i do, you want quality. Do yourself a favor and don"t cheap out on a main component like a crank or a cam. buy a Hot Rods and do it right the first time. This thing is built like a tank. That's really it Hot Rods you did it again for me. Does it come with crank bearings? Mine are ruined so does this kit come with them? Installed in new bearings with no issues and after a easy break in has had no issues. I have 27 hours on it still no play. If I would do it again I might of had my stock one rebuilt however this is alot easier. The connecting rod even came with drilled oil lube holes that the stock crank did not have. I had to rebuild the motor in my 01 CR250 and this crankshaft assembly was a perfect upgrade with a perfect fit. I recommend this product. Great product. Run them in all of my bikes. The OEM crank locked up on the big end rod bearing at 35 hours. The Hot Rods crank was a full replacement, pull the old one and slap the new one in. I waited until we had enough time on the Hot Rods crank to write this review and the crank has went 60 hard hours at race pace and still within factory specs. I would recommend this crank and will buy again. stock crank went out first year I had the bike. This crank has lasted almost 3 years with very little if any wear. I change the oil a lot and this helps for sure. I have now used two of the cranks. one a CfR150R and CR500AF. Both cranks have had excellent quality. Both have run great. I am really impressed by the way they run. I have used HotRods cranks in multiple bikes that I own or have owned over the years. They drop in perfectly and provide an excellent replacement to OEM with heavier duty product.I have these rods in both my 250f and my KX450f and am completely happy with the product. Haven't had any problem with Hot Rod Cranks. Have used them in a few different applications. (on other rebuilds) for friends. Always easy to install and works as described!!! Only have 13 hours on the crank but it's still ticking. Does this come with lower bearings? BEST ANSWER: The crankshaft comes with the wrist pin bearing only. Hot Rods a have main bearing and seal kit available at a decent price. This is the only aftermarket crankshaft I will use in our race bikes as the quality is very good. It did for my make and model. You might want to check the item part description to see if it will include crank bearings for your make and model that your getting it for. This does not come with the crank case bearings? They need to purchased separately. It does come with the top end bearing as stated in the description. my crank came pressed together with connecting rod only as I expected. It does not come with lower bearings. Do this fit a 97 rm125? Can I order a +4mm stroker hot rods crank(hotrods part number 4107)? It is for the 89 Honda TRX 250r fourtrax. Price? BEST ANSWER: Unfortunately, we don't carry that part. Sorry.